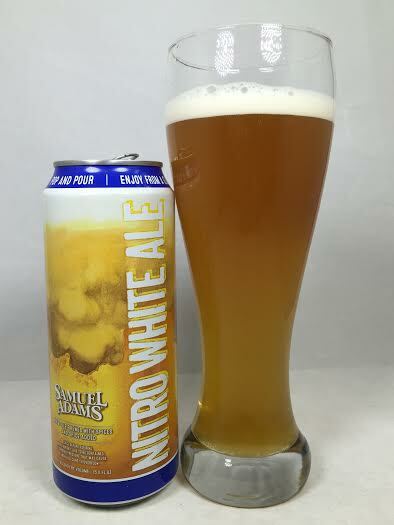 Time for another trip into the Samuel Adams Nitro Project with a Witbier. Usually the stout is subjected to the nitro treatment, but can other styles benefit? That is what Sam Adams is trying to prove with Nitro White Ale which is a wheat ale with Citra hops and their beloved Grains of Paradise. Pours a cloudy, light orange with two fingers of a creamy, white head. It smells like a Sam Summer Ale with faint hints of orange peel and wet grain. The taste doesn't have pop of real fruity hops or citrus, but instead it is just ghostly remnants of any kind of orange or lemon that once inhabited the inside of the can. The more prominent flavor is the aforementioned wet grain which is now more of a wet straw or hay and the overall taste is similar to a Miller Lite or any of the other common adjunct macro brews. The taste lingers endlessly and your taste buds are desperately trying to grasp for something else, but all they find is maybe the smallest bit of black pepper, but that's it. Mouthfeel is definitely silky thanks to the nitro aspect and there's no alcohol to speak of. While it does have the familiar nitro feel, it is still too calm and thin with too-clean of a finish which is remarkably dry. If you imagined a nitro version of Sam Summer Ale (or any of the other hundreds of Sam Adams wheat ales), then this would be it. Citra hops? I mean, you can barely detect any as the wheat malts have forced their way to the front and created a generic ale taste with no citrus whatsoever. It's bland at best (more like "generic"), but I still found myself turning away from additional sips. This is a beer where the nitro was a gimmick rather than an enhancement.